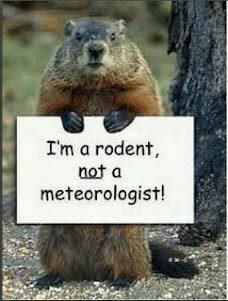 An anonymous source sent this photo to me this morning, encouraging that the voices of marmots everywhere be heard. I apologize for the lack of photo credit, but promised that this marmot's plea be heard loud and clear by marmoteers near and far. Happy Groundhog day! For marmot enthusiasts, this is a BIG week. Why? Because February 2nd is Groundhog Day...the only holiday named after an animal (turkey day does NOT count), and the only holiday celebrating animal behavior. A perfect pairing from my perspective. So the news stories have started (we often are asked to comment) and I was touched by one in the Los Angeles Times today about the caretaker or Dunkirk Dave. Check it out; it's a story about a man who cares for injured groundhogs. What a kind man.